While we have already covered one Samichlaus tradition in Switzerland, we would now like to introduce you to a Saint Nicholas custom which is special to the town of Wil. St. Nikolaus was a Saint with roots in Myra. He passed away on December 6 in the year 343. There are lots of accounts about this extraordinary bishop who was well known for his generosity. The modern day St. Nicholas in Wil would tell one of the stories which is age appropriate for the kids attending. "It seems clear that younger kids believe in Samichlaus, but we never claim to be St. Nicholas himself." In the old days, St. Nikolaus and his helper were a feared couple. We still hear stories that they would rattle chains during visits, beat kids for misbehaving, or even put them into their sack only to be released in a nearby forest! This has changed over the years, and the couple now portraits friends of the children. Today, St. Nicholas and Knecht Ruprecht will congratulate kids on their good behavior and try to induce improvements in other areas. According to Stefan Giezendanner, a 22 year veteran of the St. Nikolaus Gruppe Wil, cleaning up and better listening to parents are topics during most visits. "Some grandparents are still threatening the kids with the St. Nikolaus, and we can sense this fear as soon as we enter the living room," he describes. At the end, Knecht Ruprecht will give out the goodies: Mainly nuts, oranges, sweets, gingerbreads or small gifts. Some families with Italian roots celebrate a slightly different tradition and Knecht Ruprecht will have to carry lots of toys and gifts - almost like an American Santa. Is Switzerland the ultimate land of bread?! Currently, the events are organized by 14 couples and 3 members who take care of the expensive clothes and the administration. They truly love this tradition and look forward to the "three greatest days of the year." During three days, they will visit about 200 families and 70 schools or other organizations! "We have seen a positive trend during the last few years where families celebrate traditions in more meaningful ways. This shows in the way our visits are prepared, and a special atmosphere is created when we entering the living room. I can remember that during my first years, we were trained how to turn off the TV when we wanted to celebrate our visit. Our members have a dangerous job, as most parents reserve us a spot right by a fireplace... That's a huge temperature shock when coming from the freezing outside!" says Mr. Giezendanner. "The long experience and training allow us to deal with almost every situation. But there are always surprises. One St. Nikolaus could not stop a laughing attack because the violin play was really, really bad...", Giezendanner confesses. "Or one time, I wanted to wake up a lying cat and was told by the elderly couple that it had been deceased for a few hours!" Regardless of the challenges, everyone involved agrees that the light in kids' eyes is a great reward for this volunteer work. 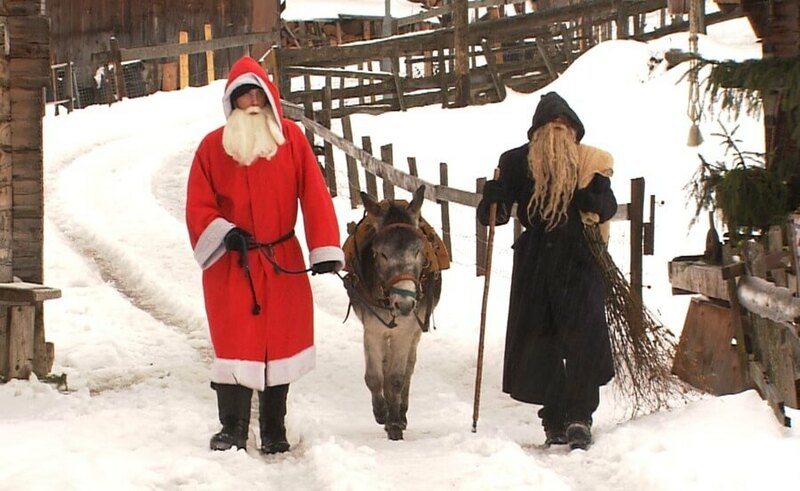 There are many associations that ensure the tradition of St. Nicholas in Switzerland. 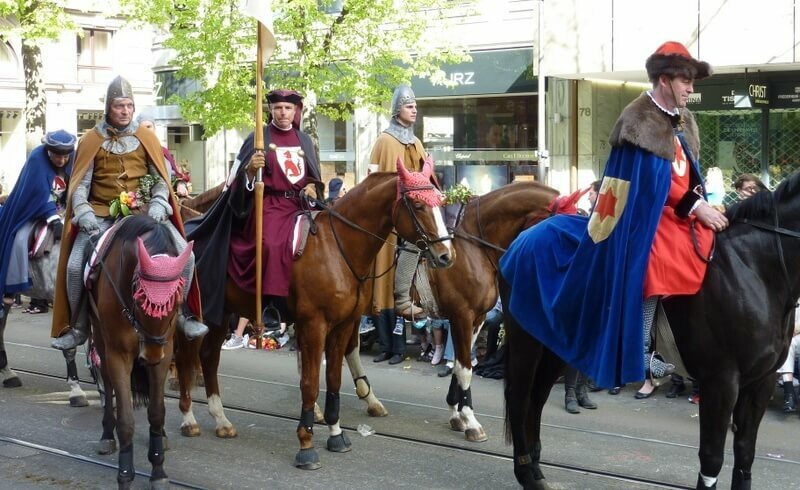 In regions with less of catholic history, the men are dressed as Samichlaus and Schmutzli. But all have the same goal in mind: Keep the tradition alive, be a part of the advent season, and support the parents. Ask them to come visit your family and with a bit preparation, you will have a great St. Nikolaus experience!